You can apply for scholarships in Delaware if you are a resident and are planning to get a college degree there. You can find plenty of options for financial grant programs if you conduct a thorough search of what is available in this state for potential scholars like you. The scholarships that are being awarded are very important as they help ease the financial burden among students as well as on their parents. Whatever the amount or cost that the award would be able to give you, always think that is will help you get through college. Scholarships are given by different types of organizations and so requirements and standards can vary through different scholarship offerings. This is one reason why you should not give up when you get rejected for one application. Look for as many scholarships as you can and try to see what their exact requirements are for you to know where you can get your best chances of getting the scholarship. 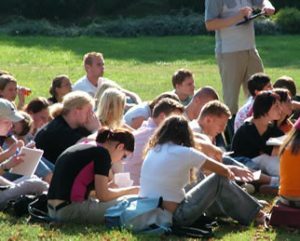 Some programs require high academic records, whereas others only require you to be a member of a particular group in order to qualify. Some require participation in community activities while others only need you to submit your name and contact address. If you are particularly talented in your academic skills, then you should apply to the George E. Gordy Family Education Trust Scholarship. They require a 2.75 GPA for those who would be graduating from the Sussex County Delaware High School. There is also the Carson’s Scholars Fund which is given to students in grades 4 to 11 who have achieved high academic grades. You can also try the Columbus Citizens Foundation College Scholarship which will help cover the cost for your tuition fees for four years. If you are eying a career in dentistry, medicine, religion or law, you can also apply to the Mark B. Holzman Scholarship. For those who are employed in blue-collar jobs, you can try the Delaware Governor’s Workforce Development Grants. Students who have been in foster care in the state of Delaware can also apply to the Ivyane D.F. Davis Memorial Scholarship which has been established by the General Assembly of the State of Delaware. The Better Business Bureau of Delaware Student Ethics Scholarship is given to students who can show exemplary leadership, community involvement, as well as academic achievement. For those intending to attend the University of Delaware, there is the B. Bradford Barnes Scholarship. Applicants must be included among the top 25 of their class and should be enrolled on a full-time basis. The grant is comprehensive and covers costs of books, room and board, and tuition fees. To those who will be enrolling in courses in education, there is the Critical Need Teacher Scholarship given by the Delaware Higher Education Commission. Applicants should be those who would be working in critical need areas and who has temporary or limited certifications. The Moody’s Foundation offers the Moody’s Mega Math Challenge which provides grants to groups of three to five students who can win the challenge.